Type I IFNs (IFN-α/β) modulate innate immune responses. Here we show activation of transcription factor IFN regulatory factor 3, the synthesis of large amounts of IFN-β mRNA, and type I IFN signal transduction in macrophages infected with Listeria monocytogenes. Expression of the bacterial virulence protein listeriolysin O was necessary, but not sufficient, for efficient IFN-β production. Signaling through a pathway involving the type I IFN receptor and Stat1 sensitized macrophages to L. monocytogenes-induced cell death in a manner not requiring inducible NO synthase (nitric oxide synthase 2) or protein kinase R, potential effectors of type I IFN action during microbial infections. The data stress the importance of type I IFN for the course of infections with intracellular bacteria and suggest that factors other than listeriolysin O contribute to macrophage death during Listeria infection. Type I IFNs are a family of structurally related proteins comprising several IFN-α and one IFN-β species (1). They are synthesized in response to a variety of infectious microbes including viruses, bacteria, and protozoa (2, 3). The molecular events preceding IFN-α/β synthesis are best understood in the case of virus-infected fibroblasts and include the synthesis and activation of transcription factors belonging to the IFN regulatory factor (IRF)4 protein family (4, 5). Immediately after infection, IRF3 is phosphorylated on serine residues and activated to cause the synthesis of IFN-β and IFN-α4. At a later stage of infection, IRF7, a type I IFN target gene, initiates the synthesis of the majority of IFN-α subtype mRNAs and thus a second wave of IFN production (6, 7). After bacterial infection of macrophages and other immunocytes, IRF3 may similarly play a role in type I IFN production. Notably, LPS was recently shown to activate IRF3 (8) through signals downstream of Toll-like receptor 4, but not the Toll-like receptor 4 adapter protein MyD88 (9). By binding to a cell surface receptor composed of IFN-α receptor 1 (IFNAR1) and IFNAR2 chains, IFN-α/β generate an intracellular signal, which is relayed to the receptor-associated Janus protein tyrosine kinases Janus kinase 1 and Tyk2. These phosphorylate two members of the Stat family, Stat1 and Stat2. The phosphorylated Stats form two distinct transcription factors. IFN-stimulated gene factor 3 (ISGF3) consists of a Stat1-Stat2 heterodimer in conjunction with a third protein, IRF9. This transcription factor binds to promoters of IFN-inducible genes containing a DNA sequence named IFN-stimulated response element (ISRE). In addition, a Stat1 dimer is formed that binds to a distinct response element, the γ-IFN-activated sequence, to regulate IFN-induced transcription (10, 11, 12). Type I IFNs modulate immune responses (3). Their most prominent effect is to mount an innate immune response to virus by inducing cells to establish an antiviral state, characterized by the appearance of IFN-induced gene products that inhibit the viral life cycle. In case of some viruses, type I IFNs also promote programmed death of infected cells (13). Protein kinase R (PKR), an enzyme induced by IFNs and activated by virus and double-stranded RNA, was suggested to be involved in sensitizing cells to apoptosis (14, 15). Besides their role in antiviral immunity, type I IFNs were recently shown to contribute to immune responses to the intracellular protozoan parasite Leishmania major (16). In this situation, inducible NO synthase (iNOS) was suggested to be a critical target gene, induced by the combination of type I IFNs and intracellular L. major parasites. Similarly, type I IFNs are thought to be required for iNOS induction in response to LPS (17). Consistent with this, macrophages from mice deficient for the IFNAR-associated kinase Tyk2 produce virtually no NO in response to LPS (18). The studies reported here were conducted to investigate the conditions of type I IFN synthesis and the role of these cytokines during infection of macrophages with the facultative intracellular bacterium Listeria monocytogenes (19). Whereas L. monocytogenes is ingested and efficiently killed by IFN-γ-activated macrophages, it multiplies in the cytoplasm of resting macrophages. The bacterial virulence factor listeriolysin O (LLO), assisted by other virulence proteins, forms pores in the phagosome membrane and is thus essential for cytoplasmic escape (20). Cytoplasmic L. monocytogenes infection eventually causes death of the infected cells (21, 22, 23). Recent studies suggest that LLO not only causes lysis of cell membranes, but that it contributes to infection as a signaling molecule inducing cytokine secretion (24, 25, 26). The lytic and signaling activities were shown to reside in physically separable portions of the molecule. We have previously shown that the activation of p38 mitogen-activated protein kinase or the induction of the suppressor of cytokine signaling 3 protein in L. monocytogenes-infected macrophages does not require cytoplasmic escape (i.e., the LLO protein) and can be caused by heat-killed bacteria (27). In contrast, the findings reported in this paper show that the signals causing high levels of type I IFN secretion depend on the expression of LLO. We further show that infection-borne type I IFN plays an important role by sensitizing macrophages for efficient, L. monocytogenes-mediated cell death. LPS (Sigma-Aldrich, St. Louis, MO) was from Salmonella minnesota and was used at a concentration of 1 μg/ml. IFN-γ (provided by G. Adolf/Boehringer Ingelheim, Vienna, Austria) was used at a concentration of 10 ng/ml. Recombinant IFN-β was purchased from Calbiochem (La Jolla, CA) and was used at a concentration of 1000 U/ml. Cycloheximide (CHX; Sigma-Aldrich) was added 30 min before infection and was used at a final concentration of 50 μg/ml. Polyclonal rabbit antiserum to IRF3 has recently been described (28). Rabbit antiserum to Y701-phosphorylated STAT1 was purchased from New England Biolabs (Beverly, MA) and used at a dilution of 1/1000. A mAb recognizing the STAT1 N terminus was purchased from Transduction Laboratories (Lexington, KY). mAbs recognizing extracellular signal-regulated kinases (ERKs) were also purchased from Transduction Laboratories and were used at a dilution of 1/2000 in Western blots. All animals were housed under specific pathogen-free conditions.IFNAR1- and IFNAR1/IFN-γ receptor 1 (IFNGR1)-deficient mice (29, 30) were obtained, respectively, from Maries van den Broek (University of Zurich, Switzerland) and B&K Universal (Grimston, U.K.). Both strains were in a 129Sv genetic background. Stat1-deficient mice (31) were in a mixed 129Sv/CD1 background. Mice deficient for the iNOS or PKR genes have recently been described (32, 33). To obtain bone marrow from femurs, the animals were sacrificed between 2 and 4 mo of age. Bone marrow-derived macrophages were obtained by culture of bone marrow in L cell-derived CSF-1 as described (34). The CSF-1-dependent macrophage line Bac 1.2F5 was grown as described (35). L. monocytogenes wild type (wt; strain LO28 (36)), the isogenic, nonhemolytic mutant that lacks the hly (LLO) gene, and L. innocua wt (37) were cultured in brain heart infusion broth. L. innocua transformed with a plasmid containing the hly gene (LLO) under the control of the PrfA regulator (38) was grown in presence of 5 μg of erythromycin per milliliter of brain heart infusion broth. To obtain bacterial supernatants, bacteria were grown for 18 h and centrifuged for 10 min at 5000 rpm, and supernatants were passed through a 0.22-μm filter. Fifteen minutes before use, supernatants were adjusted to a final DTT concentration of 5 mM to ensure LLO activity. Determination of LLO activity (hemolytic units) in bacterial supernatants was conducted as described (38). A protocol for this procedure has recently been described (39). Abs were used as indicated above or in the figure legends. We have recently described our conditions for this assay (40). As a probe, a double-stranded oligonucleotide corresponding to the ISRE sequence from the ISG15 promoter was used (41). Total RNA was extracted from macrophages using the RNeasy reagent kit and the manufacturer’s instructions (Qiagen, Hilden, Germany). The cDNAs used in the real-time PCR assays were reverse transcribed from 5 μg of total RNA using the Oligo(dT)12–18 primer and the RevertAid M-murine leukemia virus reverse transcriptase for first strand cDNA synthesis (MBI Fermentas, St. Leon-Rot, Germany) according to the manufacturer’s recommendations. Real-time PCR experiments were run on the ABI PRISM 7700 Sequence Detection System (Applied Biosystems, Foster City, CA) to amplify the hypoxanthine phosphoribosyltransferase (HPRT) housekeeping gene chosen as an endogenous control for normalization of the cDNA load and the IFN genes as described (42). TaqMan probes (METABION, Planegg-Martinsried, Germany) were labeled either with the reporter dye FAM or tetrachloro-6-carboxy-fluorescein and the quencher dye TAMRA. Real-time PCR assays targeting HPRT and IFNs were performed with the following probes, forward (f) and reverse (r) primers: HPRT/tetrachloro-6-carboxy-fluorescein, 5′-TGGGAGGCCATCACATTGTGGC-3′; HPRT-f, 5′-TTGCTCGAGATGTCATGAAGGA-3′; HPRT-r, 5′-TGAGAGATCATCTCCACCAATAACTT-3′; IFN-β-FAM, 5′-AAGCATCAGAGGCGGACTCTGGGA; IFN-β-f, 5′-ATGAGTGGTGGTTGCAGGC-3′; IFN-β-r, 5′-TGACCTTTCAAATGCAGTAGATTCA-3′; IFN-α4/FAM, 5′-AGACTCCCTGCTGGCTGTGAGGACA-3′; IFN-α4-f, 5′-CCTGTGTGATGCAGGAACC-3′; IFN-α4-r, 5′- TCACCTCCCAGGCACTGA-3′; IFN-γ-FAM, 5′-CCAGCGCCAAGCATTCAATGAGCT-3′; IFN-γ-f, 5′-TGAGTATTGCCAAGTTTGAGGTCA-3′; and IFN-γ-r, 5′- CGGCAACAGCTGGTGGAC-3′. Primers and probes were designed using Primer Express 1.5 software (Applied Biosystems). For quantitative analyses of gene expression, normalized to an endogenous control, we used the standard curve method, which was detailed previously (43). Briefly, cDNA samples were serially diluted to obtain standard curves for the housekeeping gene (HPRT) and the gene of interest (IFN-β). For each assay, the resultant cycle threshold (CT) values were plotted against the log ng input cDNA and the equation y = mx + b was determined. Then, for all experimental samples, the cDNA quantity for the gene of interest was determined from its standard curve. By using the HPRT control, we normalized target cDNA for differences in the amount added to each reaction. Finally, the normalized amount of IFN-β cDNA was divided by the quantity of the calibrator, i.e., the quantity obtained from the unstimulated cell sample. Thus, the calibrator is the 1× sample, and all other quantities are expressed as an n-fold increase to the calibrator. Macrophages were infected with Listeria (derived from overnight culture) at different multiplicities of infection (MOIs) and incubated for 1 h at 37°C in a humidified 5% CO2 atmosphere. Extracellular bacteria were subsequently killed with gentamicin-containing medium (final concentration, 50 μg/ml). After another 60 min, medium was changed to medium containing 10 μg/ml gentamicin. Then, the assay was incubated for 24–48 h. For crystal violet staining, the medium was removed and the cells were washed with PBS. Fifty microliters of 0.2% crystal violet in 20% methanol were added and incubated for 20 min. Finally, the cells were washed several times with PBS or water to get rid of excess crystal violet. Lactate dehydrogenase (LDH) release was measured as described (44) using the CytoTox 96 Non-Radioactive Cytotoxicity Assay (Promega, Madison, WI). Bacteria at an MOI of 1 were centrifuged onto macrophages in 96-well plates. To measure phagocytic uptake, the cells were incubated for 30 min at 37°C in a humidified 5% CO2 atmosphere. Extracellular bacteria were removed by several washes in PBS and the macrophages were lysed in distilled water. Intracellular bacteria were quantified by counting the number of CFU in the lysate on brain heart infusion agar plates (CFU assay). To measure numbers of intracellular bacteria at later stages of infection, the culture medium was removed after the phagocytosis period and was replaced with prewarmed medium containing gentamicin at 50 μg/ml. After incubation at 37°C, 5% CO2 for 1 h, the concentration of gentamicin was reduced to 10 μg/ml. After various incubation periods, the medium was removed and macrophages were washed with PBS and lysed with distilled water. Numbers of bacteria in the lysate were determined by CFU assay. Subgenomic DNA was isolated as described (45) and analyzed by agarose gel electrophoresis. To analyze the induction of type I IFN mRNA, cellular RNA was extracted from 2 × 106 macrophages infected with L. monocytogenes at an MOI of 10, reverse-transcribed, and subjected to real-time PCR analysis using primers to the IFN-β, IFN-α4, and IFN-γ DNA sequences. IFN-β and IFN-α4 are the “early response IFNs” during viral infection (6). IFN-γ is secreted by macrophages stimulated with a combination of IL-12 and IL-18, both of which can potentially be produced during bacterial infection (25, 46). L. monocytogenes-infected macrophages produced neither IFN-α4 nor IFN-γ (data not shown). In contrast, large amounts of IFN-β mRNA were synthesized by cells rapidly after infection with wt L. monocytogenes (Fig. 1⇓A). By comparison, LLO-deficient bacteria stimulated the synthesis of very small amounts of IFN-β mRNA. Identical results were obtained with the macrophage cell line Bac1.2F5 (data not shown) and with bone-marrow derived macrophages (BMM). IFN-β mRNA synthesis and IRF3 activation induced by Listeria monocytogenes. A, BMMs were exposed to wt L. monocytogenes (black bars) or an isogenic hly mutant strain deficient for LLO (gray bars). After the indicated periods, total mRNA was extracted, reverse transcribed, and analyzed by real-time PCR for IFN-β expression. To calculate inducibility, the value obtained from uninfected macrophages was used as a calibrator. B, BMMs infected with wt or LLO mutant L. monocytogenes were analyzed by Western blot for expression and phosphorylation of IRF3. To demonstrate direct IRF3 activation by L. monocytogenes, CHX was added before infection (last lane). In additional experiments we asked whether L. monocytogenes, like virus or LPS, induces IFN-β transcription through IRF3. Serine phosphorylation and activation of IRF3 are accompanied by a characteristic SDS-PAGE mobility shift of the phosphorylated form (28). Infection with wt L. monocytogenes at an MOI of 10 caused IRF3 activation (Fig. 1⇑B). In contrast, IRF3 activation by LLO-deficient bacteria remained below the level of detection. Thus, IFN-β mRNA synthesis reflects the LLO dependence of IRF3 activation. The dependence of IRF3 activation and IFN synthesis on the presence of LLO prompted us to ask whether the protein alone was sufficient to cause IFN-β synthesis. L. innocua is an avirulent Listeria species not encoding the L. monocytogenes pathogenicity island including the LLO (hly) gene (47). Infection with an L. innocua strain engineered to produce LLO in higher amounts than wt L. monocytogenes (L. innocua/LLO) (38) did not significantly cause IRF3 activation (Fig. 2⇓A). Consistent with this, neither wt L. innocua nor L. innocua/LLO stimulated high levels of IFN-β mRNA synthesis (Fig. 2⇓B). Infections with L. monocytogenes and with L. innocua/LLO were conducted under identical conditions (2 × 106 macrophages were infected with 2 × 107 bacteria). No significant differences in phagocytic uptake were noted between the two strains; ∼40% of the inoculum could be recovered from cells immediately after the phagocytic period. Determining the numbers of intracellular bacteria in CFU assays showed that within the time required for maximal IRF3 activation or IFN-β production, no multiplication occurred. In fact, most bacteria were killed in this phase. Therefore, the differences observed for IRF3 activation or IFN-β production are unlikely to be caused by different numbers of infecting bacteria. Later during infection, both L. monocytogenes and L. innocua/LLO replicated inside macrophages. However, maximal numbers of intracellular L. monocytogenes were noted in BMMs earlier after infection (12 h vs 24 h in L. innocua/LLO). Moreover, after the decline in numbers occurring during the killing phase after phagocytosis (up to 4 h), L. monocytogenes grew to three times the number of bacteria originally phagocytosed within the next 8 h. In contrast, L. innocua/LLO grew back within 20 h after the killing period to roughly the number of bacteria that was originally phagocytosed, suggesting that the presence of LLO alone is sufficient for cytoplasmic escape; however, additional L. monocytogenes virulence proteins are necessary for efficient escape and/or high intracytoplasmic growth rates. Effect of LLO on IRF3 activation and IFN-β mRNA induction. 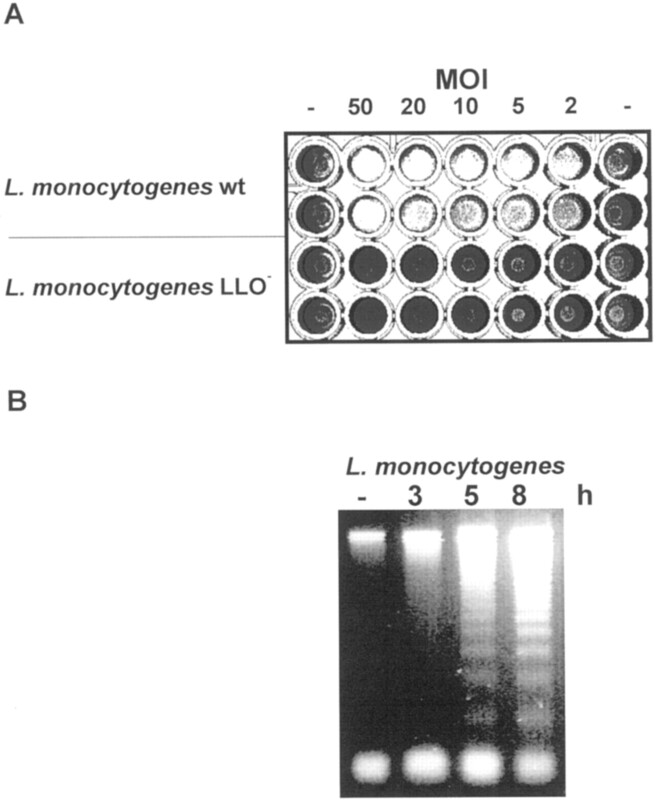 A, BMMs were infected with wt L. monocytogenes (L.m. wt) or with L. innocua expressing LLO under control of the PrfA regulator (L.i./LLO) for 1 h. IRF3 phosphorylation was determined by Western blot. 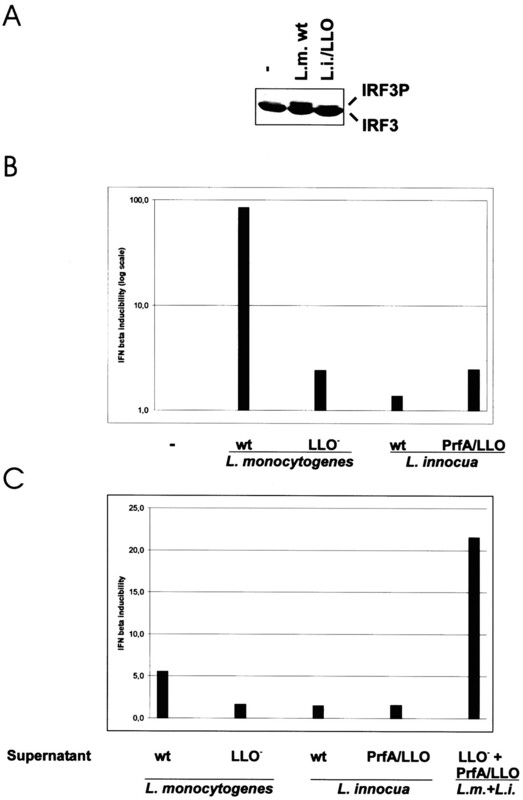 B, Bac1.2F5 macrophages were infected with wt L. monocytogenes, LLO mutant L. monocytogenes, L. innocua, or L. innocua expressing LLO under PrfA control for 4 h. Total RNA was extracted, reverse transcribed, and analyzed by real-time PCR for IFN-β expression. To calculate inducibility, the value obtained from uninfected macrophages was used as a calibrator. C, Supernatants from wt L. monocytogenes, LLO mutant L. monocytogenes, L. innocua, L. innocua expressing LLO under PrfA control, or a mixture of supernatants from L. innocua/LLO and LLO mutant L. monocytogenes were added to BMM cultures for 4 h. Total RNA was extracted, reverse transcribed, and analyzed by real-time PCR for IFN-β expression. Values indicate inducibility, using the medium control as a calibrator. Experiments with bacterial culture supernatants showed that moderate but significant IFN-β gene induction occurred when treating macrophages with supernatant from wt L. monocytogenes, diluted in culture medium to contain 25 hemolytic units/ml of LLO activity (Fig. 2⇑C). Despite much higher LLO activity (final concentration in culture medium: 82 hemolytic units/ml), supernatant from the LLO-producing L. innocua strain did not induce the IFN-β gene, unless mixed with supernatant from LLO mutant L. monocytogenes. The data suggest that LLO and a second factor present in L. monocytogenes culture supernatant cooperate in inducing IFN-β production. However, the amount of IFN-β mRNA induced by the culture supernatants was not nearly as high as that caused by bacterial infection (compare infection with wt L. monocytogenes and treatment with culture supernatant in Fig. 2⇑, B and C). The LLO-containing supernatants did not exert toxic effects on the target cells within the 4 h period required for IFN-β induction. Toxicity can be ruled out as a cause for the different ability of the supernatants to induce expression of the IFN-β gene. 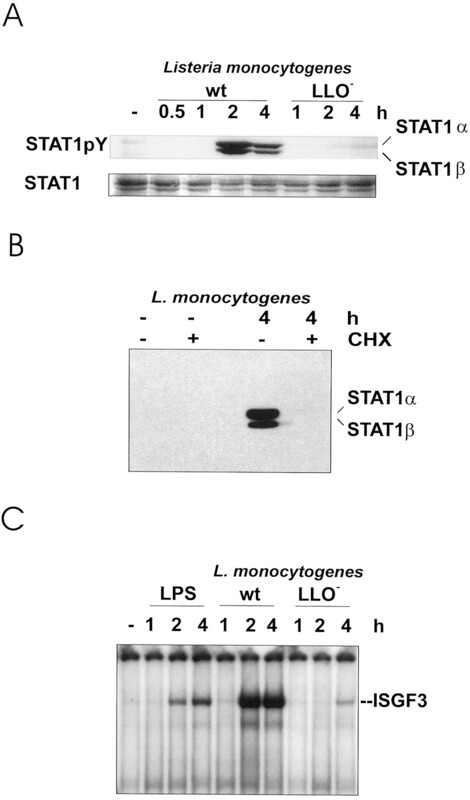 To confirm biological activity of type I IFN in L. monocytogenes-infected macrophages, we analyzed the tyrosine phosphorylation of Stat1 and the formation of transcription factor ISGF3. Macrophages were infected with bacteria for the indicated periods under the same conditions as for the experiments shown in Figs. 1⇑ and 2⇑ (2 × 107 bacteria per 2 × 106 macrophages). Stat1 tyrosine phosphorylation was observed with peak levels at 2 h (BMMs; Fig. 3⇓A) or 4 h (Bac 1.2F5 macrophages; data not shown) after infection. Addition of CHX before infection completely abolished Stat1 tyrosine phosphorylation (Fig. 3⇓B), showing that it is not directly caused by the bacteria but requires type I IFN as a mediator. As in the case of IFN-β synthesis, LLO-deficient bacteria produced minute quantities of tyrosine-phosphorylated Stat1. ISGF3 formation, measured by EMSA with an ISRE probe, closely paralleled Stat1 tyrosine phosphorylation (Fig. 3⇓C). Type I IFN signal transduction in macrophages exposed to L. monocytogenes. A, BMMs were exposed to wt L. monocytogenes or to an isogenic LLO mutant strain for the indicated periods. Thereafter, Stat1 tyrosine phosphorylation (upper panel) was determined by Western blotting with phosphospecific Abs. Stat1α is full-length Stat1 and Stat1β is a naturally occurring splice variant lacking the C terminus. To ensure equal loading, the blot was reprobed with a mAb to the Stat1 N terminus. B, Bac 1.2F5 macrophages were left untreated, treated with CHX (50 μg/ml), or infected with wt L. monocytogenes in the absence or presence of CHX. Stat1 tyrosine phosphorylation was determined by Western blot using phosphospecific Abs. C, BMMs were treated with LPS or were exposed to wt or LLO mutant L. monocytogenes for the indicated periods. ISGF3 formation was determined by EMSA using an ISRE probe with the sequence corresponding to the promoter of the IFN-inducible ISG15 gene. We monitored the fate of macrophages after continuous infection with either wt L. monocytogenes or the LLO-deficient but otherwise isogenic mutant strain at different MOIs. Macrophages were allowed to ingest the bacteria for 1 h, followed by killing of extracellular L. monocytogenes with gentamicin and further incubation of the infected cells. In accordance with results published by Barsig and Kaufmann (23), macrophage death was first noted 8 h after infection and was complete after 24–48 h. It occurred at low MOIs and required expression of the bacterial LLO. Individual L. monocytogenes cultures showed some variability with regard to their virulence, which reflected the minimal MOI required for killing macrophages and the duration of the assay until lysis was complete. Consistent results were obtained when measuring LDH release from macrophages (data not shown) or when performing cytopathic effect (CPE) assays, where remaining viable cells are stained with crystal violet dye (Fig. 4⇓A). Analysis of subgenomic DNA from infected macrophages produced a fragmentation pattern characteristic of cells undergoing programmed cell death (Fig. 4⇓B). Macrophage death in the course of infection with L. monocytogenes requires LLO expression and is accompanied by DNA fragmentation. A, BMMs in microtiter wells were exposed to wt or LLO mutant L. monocytogenes at the indicated MOI. After allowing for uptake of the bacteria for 1 h, extracellular bacteria were killed by treatment with gentamicin. Thirty-six hours after infection, remaining viable macrophages were stained with crystal violet dye. B, BMMs after infection with wt L. monocytogenes for the indicated periods were lysed and subgenomic DNA was isolated. DNA fragmentation was visualized by agarose gel electrophoresis. To examine whether the response of macrophages to type I IFN influences the course of L. monocytogenes infection, we infected BMMs isolated from mice deficient either for the IFNAR1 chain of the type I IFN receptor or, to exclude any additional effects of IFN-γ, for both the IFNAR1 chain and the IFNGR1 chain of the IFN-γ receptor (30). Compared with BMMs from wt mice, these cells showed a strongly increased resistance to cell death induced by L. monocytogenes, as determined by CPE assay (Fig. 5⇓A) or by measuring LDH release (shown for IFNAR1/IFNGR1-deficient mice; Fig. 5⇓B). Virtually identical results were obtained with macrophages isolated from Stat1-deficient mice (Fig. 5⇓A). As expected, L. monocytogenes at an MOI of 10 failed to cause Stat1 tyrosine phosphorylation in BMMs from IFNAR1-deficient mice (Fig. 5⇓C). Consistent with findings in Tyk2- or Stat2-deficient cells with impaired type I IFN signaling (18, 48), IFNAR1-deficient BMMs expressed much lower levels of Stat1 than their wt counterparts. Despite this, the transcription factor was still present at sufficient levels to be activated, as signaling from the IFN-γR was nearly as efficient as in wt BMM. Type I IFN signaling sensitizes BMMs to cell death caused by infection with L. monocytogenes. A, BMMs were isolated from IFNAR1-deficient, IFNAR1/IFNGR1-deficient, or Stat1-deficient mice or from control mice with a matched genetic background. The cells were seeded in microtiter wells and infected with wt L. monocytogenes or LLO mutant L. monocytogenes at different MOIs as indicated. After allowing for uptake for 1 h, extracellular bacteria were killed by treatment with gentamicin. Thirty-six hours after infection, remaining viable macrophages were stained with crystal violet dye. B, BMMs from mice lacking both IFN-α and IFN-γ receptors were isolated, seeded into microtiter wells, and infected with L. monocytogenes as described in A. Thirty-six hours after infection, LDH activity released from infected cells into the culture medium was determined. ♦, Macrophages from wt mice infected with wt L. monocytogenes; ▪, IFNAR/IFNGR-deficient macrophages infected with wt L. monocytogenes; •, wt macrophages infected with LLO− L. monocytogenes; ▴, IFNAR/IFNGR-deficient macrophages infected with LLO− L. monocytogenes. C, Lack of Stat1 tyrosine phosphorylation in IFNAR1-deficient macrophages after infection with wt L. monocytogenes. BMMs were exposed to wt L. monocytogenes for the indicated periods. Thereafter, Stat1 tyrosine phosphorylation (upper panel) was determined by Western blotting with phosphospecific Abs. Stat1α is full-length Stat1 and Stat1β is a naturally occurring splice variant lacking the C terminus. 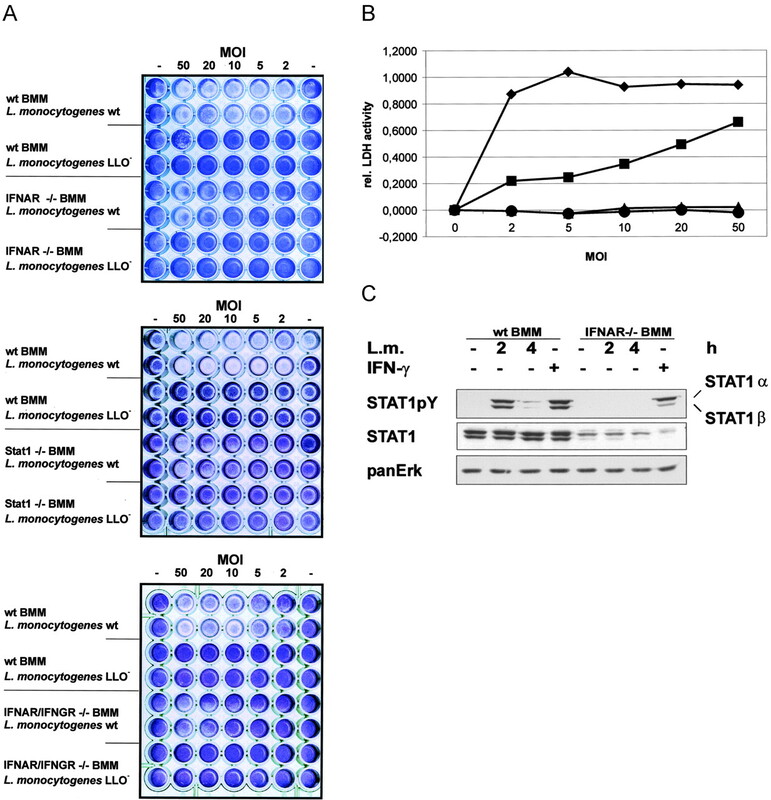 Differences in Stat1 expression levels between macrophages from wt and IFNAR1-deficient mice were analyzed by reprobing the blot with a mAb to the Stat1 N terminus. As a normalization control, the blot was finally probed with Abs to ERK1 and ERK2 (pan ERK). Genetic and biochemical experiments thus suggest that type I IFNs regulate macrophage sensitivity to bacteria-induced death through Stat1 dimer and/or ISGF3 target genes. Studies from several groups demonstrated type I IFN-mediated induction of the PKR and iNOS genes and suggested an involvement of these molecules in apoptosis induction by, respectively, virus or bacterial LPS (14, 15, 49). This prompted us to test whether iNOS or PKR might be the critical target genes for the sensitizing effect of type I IFN on L. monocytogenes-induced cell death. CPE assays were performed with macrophages from iNOS- or PKR-deficient mice. They clearly established that neither protein was required for efficient macrophage killing by L. monocytogenes (data not shown). A wealth of recent literature has established type I IFNs as modulators of immune functions beyond innate resistance to virus (2, 3, 50). Their activities include contributions to innate immunity against other groups of microorganisms either through induction of antimicrobial target genes or through effects on dendritic cell maturation and function, NK cell cytotoxicity, or Th1 differentiation. In this report, we describe an additional biological activity of type I IFN in regulating the fate of macrophages infected by intracellular bacteria: the sensitization to bacteria-induced cell death. IFN-β is produced in response to infection with L. monocytogenes expressing its major virulence determinant, LLO. IRF3 participation in the induced synthesis of IFN-β mRNA is in agreement with a recent report demonstrating proapoptotic activity of the transcription factor (51). The immune response to intracellular bacteria like L. monocytogenes shows a high level of complexity, involving phagocytes and CD8+ T cells as well as humoral effector systems (19, 52, 53). Within this scenario it is difficult to judge the relative impact of type I IFNs and their death sensitization of infected cells. Of potential interest for the relationship between LLO-dependent killing of host cells and the virulence of Listeria are two recent publications examining the importance of an N-terminal PEST sequence for the stability and biological activity of LLO during L. monocytogenes infection. Whereas Lety et al. (54) find that deletion of the LLO PEST sequence inhibits cytoplasmic escape, Decatur and Portnoy (55) report that infection with L. monocytogenes expressing the LLO deletion mutant causes a more rapid lysis of macrophages and, due to the deprivation of their host, reduced bacterial progeny. Both studies concur that L. monocytogenes containing the PEST-deleted LLO is less virulent in mice. Decatur and Portnoy, therefore, suggest that the host benefits from rapid macrophage death because it limits bacterial propagation and spread. In agreement with this, an L461T mutation of LLO, shifting its pH optimum from acidic to neutral pH and thus increasing its activity under conditions found in the macrophage cytoplasm, again caused premature host cell lysis and, correspondingly, a strongly decreased virulence in animals (56, 57). By the same token, type I IFNs might be expected to limit bacterial spread due to their enhancement of macrophage lysis. However, the data obtained in mice devoid of functional type I IFN signal transduction are inconsistent with this assumption. Judging from the lethal infectious dose of Listeria, IFNAR1-deficient mice or Stat2-deficient mice show no striking differences to their wt counterparts (Refs. 29 and 30 ; C. Schindler, unpublished observations). However, compared with wt animals, the bacterial loads observed in spleens and livers of infected mice with impaired type I IFN responses were significantly lower (C. Schindler, unpublished observations). The data suggest that type I IFNs decrease the speed and efficacy of clearing L. monocytogenes infection, but that other immune mechanisms like cytotoxic T cells are able to compensate for this impediment, preventing an increase in lethality. This interpretation is in agreement with a recent report showing that the virulence of Mycobacterium tuberculosis in mice is directly correlated with the ability to produce type I IFN, and that administration of type I IFN increased the number of bacteria found in the lung (58). Taken together, the data suggest an adverse effect of type I IFN on the clearance of intracellular bacteria by infected macrophages. Signal transduction resulting from L. monocytogenes infection can be distinguished by its requirement for LLO. For example, p38 mitogen-activated protein kinase activation occurs equally well in the presence or absence of LLO and can be elicited by heat-killed bacteria (27). In contrast, NO production, NF-κB activation, IL-12 and IL-18 production, and, as shown here, IRF3 activation, require the expression of LLO (24, 25, 26, 59, 60). Conceivably, part of the L. monocytogenes-stimulated signals derive from the recognition of bacterial surface components and are transmitted via Toll-like receptors. Others may derive from an unidentified LLO surface receptor or, alternatively, may require LLO-dependent cytoplasmic escape, i.e., the intracellular localization of L. monocytogenes may influence signal transduction. Although the results with bacterial supernatants shown in Fig. 2⇑ could be explained by the cooperation of LLO with other L. monocytogenes protein(s) to stimulate signaling from the host cell surface, we favor a working hypothesis according to which LLO’s main function lies in the delivery of L. monocytogenes to the host cell cytoplasm, where other virulence factors stimulate or, together with LLO, participate in stimulating IRF3 activation. The inability of LLO alone to cause IFN-β expression is supported by the experiments with L. innocua/LLO. In accordance with the literature (61, 62, 63), we find that LLO expression confers the ability for intracellular growth and, therefore, cytoplasmic escape. Because IFN-β expression is an early event occurring before bacterial replication, which proceeds at different rates for L. monocytogenes and L. innocua/LLO, the data suggest that cytoplasmic LLO alone may be insufficient to affect the IFN-β gene, despite its ability to cause cytoplasmic escape. The mode by which L. monocytogenes induces macrophage death and the role Stat1 target genes have in this process remains to be clarified. The DNA fragmentation we observed suggestsapoptosis, but our attempts to verify this assumption by demonstrating caspase activation or annexin V binding were inconclusive. At this moment, alternative death scenarios with secondary DNA fragmentation must be considered. Some genes involved in programmed cell death have been connected to type I IFN signaling and/or Stat1. One of these is PKR, a type I IFN-inducible gene that has been linked to apoptotic cell death in response to a large variety of stimuli including TNF, stress, and influenza virus infection (14, 15, 64, 65). However, PKR-deficient macrophages were as sensitive to L. monocytogenes as their counterparts from normal mice. A second gene of interest in this regard is that encoding iNOS (or NOS2). The iNOS induction by LPS requires intermediary type I IFN synthesis and was linked to LPS-induced apoptosis (49). iNOS-deficient macrophages and wt cells were equally sensitive to L. monocytogenes-induced cell death. Studying viral infection, Balachandran et al. (66) suggested a sensitizing effect of type I IFN to apoptosis through regulation of a Fas-associated death domain protein containing death-induced signaling complex causing activation of caspase 8. In contrast, Quignon et al. (67) described a caspase-independent mode of IFN-α-mediated cell death requiring the nuclear body-associated, IFN-inducible protein promyelocytic leukemia. These and other possibilities will have to be considered in further studies about the sensitization of type I IFN to L. monocytogenes-induced macrophage death. We gratefully acknowledge Pascale Cossart for providing bacterial strains, valuable reagents, and helpful advice. We would also like to thank Maries van den Broek (University of Zurich, Switzerland) for IFNAR1-deficient mice and Christian Bogdan (Institute of Medical Microbiology, Immunology and Hygiene, University of Erlangen, Germany) for iNOS-deficient mice. Critical reading of the manuscript by Manuela Baccarini and Pavel Kovarik is gratefully acknowledged. ↵1 This work was supported by the Austrian Research Foundation (Grant P15272 to T.D.) and, at an early stage, by the Austrian National Bank (Grant 7375). ↵2 Current address: Institute of Pharmacology, University of Vienna, Währingerstrasse 13A, A-1090 Vienna, Austria. ↵4 Abbreviations used in this paper: IRF, IFN regulatory factor; IFNAR, IFN-α receptor; ISGF, IFN-stimulated gene factor; ISRE, IFN-stimulated response element; PKR, protein kinase R; iNOS, inducible NO synthase; LLO, listeriolysin O; CHX, cycloheximide; ERK, extracellular signal-regulated kinase; IFNGR, IFN-γ receptor; wt, wild type; HPRT, hypoxanthine phosphoribosyltransferase; FAM, 6-carboxy-fluorescein; LDH, lactate dehydrogenase; MOI, multiplicity of infection; BMM, bone-marrow derived macrophage; CPE, cytopathic effect. MacMicking, J. D., C. Nathan, G. Hom, N. Chartrain, D. S. Fletcher, M. Trumbauer, K. Stevens, Q. W. Xie, K. Sokol, N. Hutchinson, et al. 1995. Altered responses to bacterial infection and endotoxic shock in mice lacking inducible nitric oxide synthase. [Published erratum appears in 1995 Cell 81:following 1170.] Cell 81:641.